My grandmother is an excellent cook. She lives in Poland, but whenever I talk to her on the phone or Skype, she tells me about her latest recipe creations. She would be an excellent healthy food blogger because she has a knack for transforming typically high calorie dishes into light yet flavorful meals. I only lived in Poland for about 7 years of my life, but my sister and I traveled back to visit almost every summer through middle school and high school. She made us countless delicious meals, including Polish classics like pierogi, hunter’s stew, leniwe kopytka (potato and cheese dumplings), surowki (vinaigrette dressed coleslaws), kotlety schabowe (thinly pounded and breaded pork tenderloin), and kotlety mielone (a cross between hamburger and meatloaf), tomato soup, and Ukranian borscht. One summer, when I was 12, I decided to write down her recipes for my favorite classics. It was very challenging since she never measures anything! I’d ask how much flour she was using, for example, and she would say “a glassful.” Whenever she seasoned something it was with “a good amount” or a “heaping spoonful.” Back then I was all about precision, so it was frustrating to guesstimate how much of everything she was using. Now that I’m older and cook more often, I can relate to her way of doing things. It’s actually pretty tricky to blog recipes for me because my inclination is to eyeball measurements rather than busting out the measuring cups and spoons. In spite of this tendency, here is a precisely measured recipe for one of my childhood favorites, Ukrainian Beet Soup! It’s packed full of veggies and so incredibly flavorful. The rye-bread taste of caraway seeds really stands out in this soup. 1. Cook sliced potatoes and beets in stock in a 2 gallon stockpot until vegetables are fork tender, about 20 minutes. Strain the stock into a large bowl by pouring everything through a strainer. Set the potatoes and beets aside and keep the stock. Melt the butter and olive oil in the stockpot over medium-high heat. Stir in the onions, celery, carrots, caraway seeds, and salt. Cook down for 3-5 minutes, or until the onions begin to turn translucent. Add the cabbage and pour in the reserved stock. Covered, reduce heat to medium, and cook for about 10 minutes until all vegetables are tender. Add the potatoes and beets back into the stockpot. Stir in vinegar, tomato sauce, and dill. Season with black pepper to adjust the taste to your liking. Cover, reduce heat to low, and simmer for another 30 minutes. Serve topped with sour cream and fresh dill. This is seriously one of my favorite soups of all time! Even if you don’t love beets, give it a try. It’s a wonderful way to use the sweet root vegetable in a seriously savory dish. This is easy and delicious recipe is inspired by the flavors in baklava, a traditional rich dessert made of filo layered with chopped nuts and syrup. The original dessert originates from the Ottoman Empire; you can typically find it served at Greek restaurants. As a spread, baklava can be stirred into oatmeal or layered onto fruits and vegetables. If this recipe gets you to eat more fruits, veggies, or whole grains, I call that a win! As indulgent as it tastes, the walnuts in this recipe make it a nutritious snack choice. Walnuts provide important components of a healthy diet – an ounce of walnuts has 2.5 grams of the essential plant-based omega-3 alpha-linolenic acid (ALA), 4 grams of protein, and 2 grams of fiber to keep you feeling full. Read more about walnut nutrition here. An indulgent and flavorful dessert spread to enjoy with fresh fruit, toast, or even celery sticks! Preheat oven to 350 degrees. Place the walnuts in a single layer on a baking sheet. Toast for 8-10 minutes, or until fragrant but not dark. Allow to cool completely. While the walnuts cool, heat the butter in a small saucepan until bubbling and beginning to turn golden brown. Do not burn; remove from heat once the butter is fragrant. Place the walnuts, browned butter, honey, cinnamon, vanilla, and salt in a food processor. Process until the mixture becomes a thick, chunky nut butter. Serve with toasted bread, apple slices, or celery. Alternatively, stir it into oatmeal or leftover quinoa heated with milk. And here it is stirred into quinoa porridge! It’s easier to make than you think- just heat 1 cup of leftover cooked quinoa with 1/2 cup milk of choice and stir in a heaping spoonful of baklava butter. Are you loving these walnut recipes? Check out more ideas below! This spicy pork tenderloin salad is served with seared tomatoes and a creamy harissa yogurt dressing. Enjoy it with a glass of riesling! 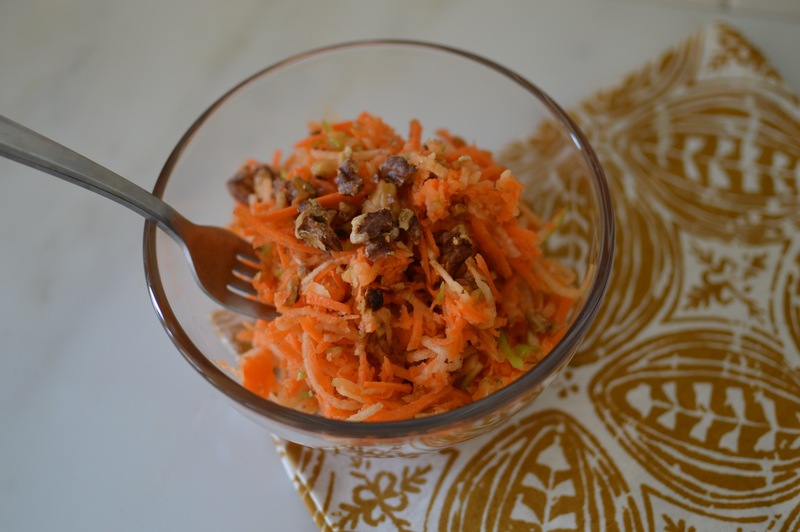 A flavorful entree salad that won't weigh you down on hot summer days! Delicious with a glass of chilled riesling. Place bell pepper, 2 tablespoons olive oil, 2 tablespoons juice, sambal oelek, 1/4 teaspoon salt, 1/2 teaspoon cumin, coriander, and garlic in a food processor; process until smooth. Place half the harissa in a large bowl and set aside. Place the remaining harissa in a microwave safe dish and cook, covered, in the microwave for 60 seconds. Stir and set aside to cool. Combine yogurt, mint, 1 tablespoon juice, and 1 teaspoon cumin in a bowl. Heat a large skillet over medium-high heat. Add 1 tablespoon olive oil; swirl to coat. Sprinkle pork with 1/2 teaspoon salt. Add pork to pan; cook 6 minutes, browning on all sides. Add pork to harissa in the large bowl, turning to coat. Sear tomato slices in the hot pan for 60 seconds each side. Remove from heat. Place pork on a rack in a pan; brush with remaining harissa from the large bowl. Bake at 425° for 11 minutes or until a thermometer registers 145°. Remove from oven; let stand 5 minutes; cut crosswise into 12 slices. Serve 3 slices over 2 cups of mixed greens with tomato slices, a drizzle of microwaved harissa, and a dollop of yogurt sauce. This recipe is an adaptation of one of Colby’s favorite meals of all time, North African Pork Tenderloin. He has enjoyed other variations of pork tenderloin that I’ve made, but this remains his top pick. If you like riesling wine, you’ve gotta try this one! One of my sister’s favorites, Kingfu Girl, is sweet, crisp, and reasonably priced at Trader Joes! It pairs perfectly with the spiciness of the pork tenderloin in this salad.